When walking into a strange hotel in a strange city, one would expect to see strangers. But walking into the chosen hotel for NARAM 60 in Pueblo Colorado, we met a lobby full of old friends and friendly faces. They looked older than we remembered, but then so did we! 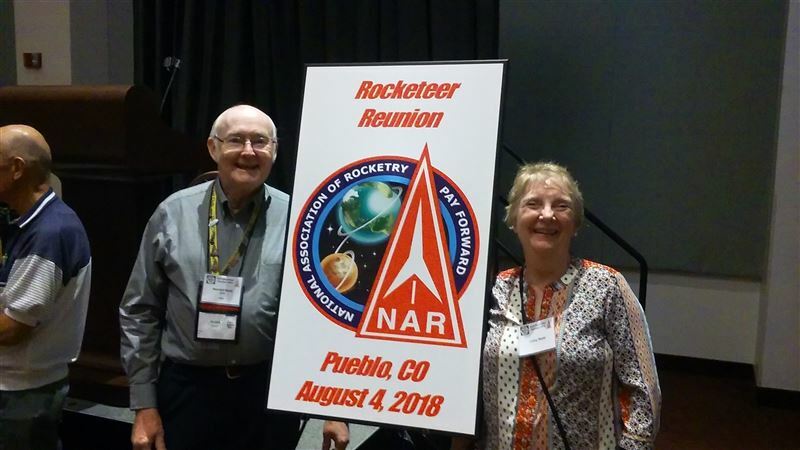 On August 4th, 2018 the NAR kicked off NARAM 60 with a fun fly and an evening reception and rocketeer reunion. We walked to the convention center with Vern and Gleda Estes and their daughter. What gracious people! One of the first people we ran into was former UROC member George Pantalos, who received his 50 year NAR membership pin later that night. Others we met were Lee Piester, Terry Lee, Bill Stein, and Ed Mitton. Ed has been a friend since 1980 when we flew at contests in Colorado. Displays were set up around the convention center. Also items for auction. The proceeds will go to the Museum of Flight in Seattle which houses the G. Harry Stein Collection. During the evening we heard from Vern Estes and Bill Stein and Lee Piester about how the hobby of model rocketry got started. (Did you know it was from a shoe salesman?) Stories and memories were shared, along with a slide show of old photos. The sport flying weather was good. The contest director Scott Alexander from Pennsylvania and his family did a terrific job of running registration, the range and the flyers meetings. We flew Randall's Mickey Mouse rocket and the gnome rocket flew perfectly. Who knew that Randall would be flying at NARAM 8 in 1966 and at NARAM 60, a mere 52 years later? What memories!